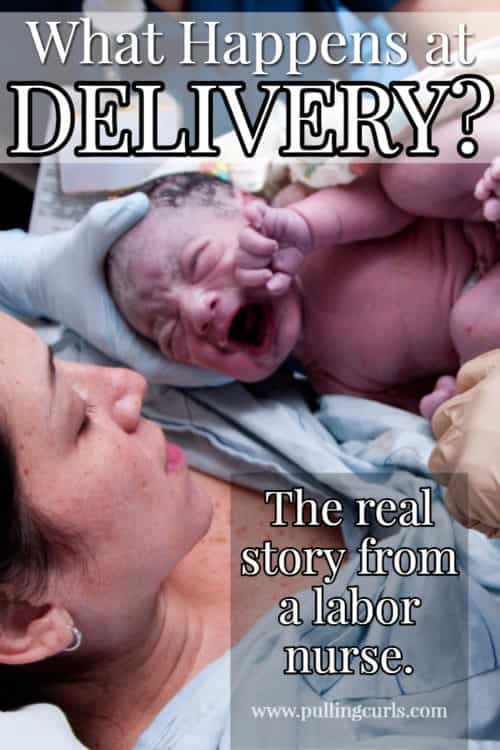 Labor and Delivery — the main action happens at delivery and it is a busy time! Let’s talk about what happens AT delivery and after delivery — so you can know a little bit what to expect when your baby is born! Right before the delivery of your baby, there are ton of things your labor and delivery nurse does. This post is going to review those steps so you can be familiar with what is going to happen. How do I know all of this? I’ve been a labor nurse since 2001 and I’m happy to say that this is an “everyday” occurrence. I’ve done it hundreds of time — and I really want you to understand what’s going to happen too! Once you hit 10 centimeters (learn more about vaginal exams), and your doctor/nurse says that you are ready to push. Then, you start pushing. Average pushing time is about 2 hours on your first baby (and considerably less on subsequent babies). You will likely push with just your nurse until the baby’s head is crowning (even when you’re not pushing). Then, the nurse will call your doctor. She will also prep the “baby exit area” for delivery (it’s just soapy water, don’t get excited — it’s just to keep that area clean). Once your doctor comes, that usually brings in another nurse to care for the baby. 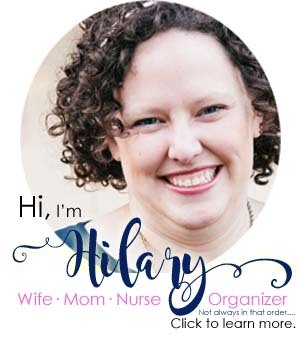 Hospital policies, normally, require there to be a labor nurse (for the mom) and a nursery nurse (for the baby). Although I am a labor nurse, I can also take care of babies right after delivery as well (but I don’t work in the nursery). 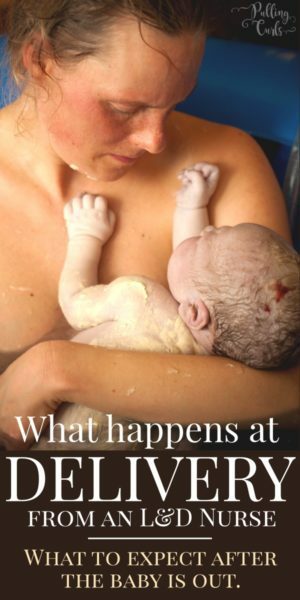 Once the baby is out, we try to do skin to skin (if you want to, some moms don’t and that’s totally fine too). If, for any reason, the baby is having a tough transition, we will take him/her to the warmer to be able to check them out more thoroughly. The baby nurse watches the baby very closely for the first 5 minutes and then assigns an Apgar score (further Apgar scores can be done after 5 minutes as well if the baby isn’t transitioning well). Most doctors do delayed cord clamping, although that doesn’t usually stop you from doing skin to skin at that point (but it could if your baby has a very short cord). We try to initiate a “golden hour” where you and your partner can just love and adore that new baby with very little interference from us. Nurses check vital signs, as well as the baby’s heart rate and breathing — all of which can be done skin to skin. Your baby nurse will hover very close by. Pro Tip: If, at any time, having the baby on your chest is “too much” please let your nurse know. 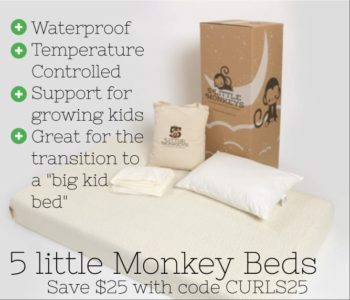 Sometimes moms feel pressured to keep the baby on them even though they are in a lot of pain or have anxiety. This time is for YOU. Use it how it makes you happiest. They will also assist you in latching the baby on if you plan to breastfeed. As for you, your labor nurse will administer Pitocin after the baby is out (Pitocin helps with bleeding and makes your uterus go back to the way it was — it is standard procedure in the US). She will also push on your belly every 15 minutes or so to check to make sure your bleeding is OK and that your uterus is clamping back down. BTW, I recommend these for the first few days home. Why does the nurse push on my belly? Think of your uterus as having a giant placenta-sized scab on it. No one loves us pushing on their belly, but it’s important we do it firmly following delivery. Your uterus is applying direct-pressure to the scab to help you not bleed. Once you leave the L&D nurse, the nurses won’t push as hard on your belly (as those first couple of hours are the ones that you are most likely to have bleeding issues). You’ll also have frequent blood pressure checks to also alert us to any issues (they are checking for any blood loss, as well as the possibility of PIH after delivery). This is NOT the blog to get in an uproar over these procedures. I’m just letting you know the usual procedure. If you want to delay or not do any of those 4 things, it is entirely up to you. Just be sure to let your nurse know. If you are in a hospital that doesn’t leave you in the same room you deliver in, you will transfer to couplet care (also called mother/baby or postpartum). You will likely have a new set of nurses in that area. Having a baby is a wonderful and confusing experience. I hope these reminders about totally normal things will help you feel more at ease during your upcoming delivery. If you’re wanting more information on usual procedures, and what to expect in the hospital — check out this Online Prenatal Class for Couples that has prepared hundreds of parents for stress-free delivery on their own timeline (in their own home). If you’re not sure you’re ready for the whole class, I also have a totally free beginning prenatal class that gives my #1 tip for labor and delivery — you won’t want to miss it! 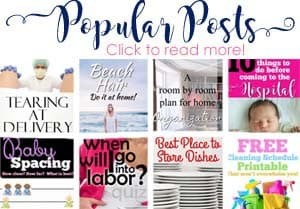 And, check out my other delivery prep posts below that! Unmedicated Hospital Delivery: Increase your chances to do it your way. Am I unclear on the fact that you have choice in many of these things, but they’re the routine things we do….